Painting this mural in Chinatown was a dream come true. 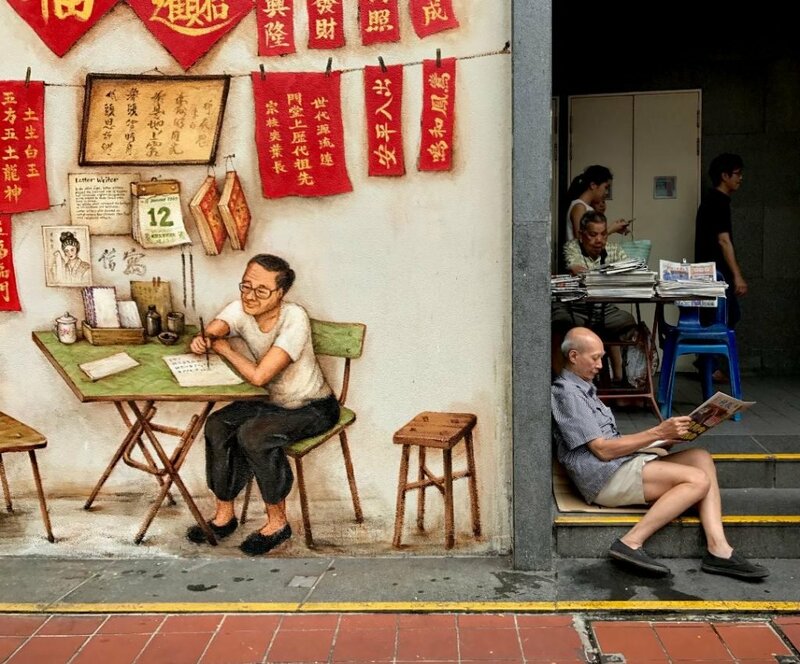 This mural is special for three reasons: Firstly, Chinatown is where I grew up and have fond memories of. 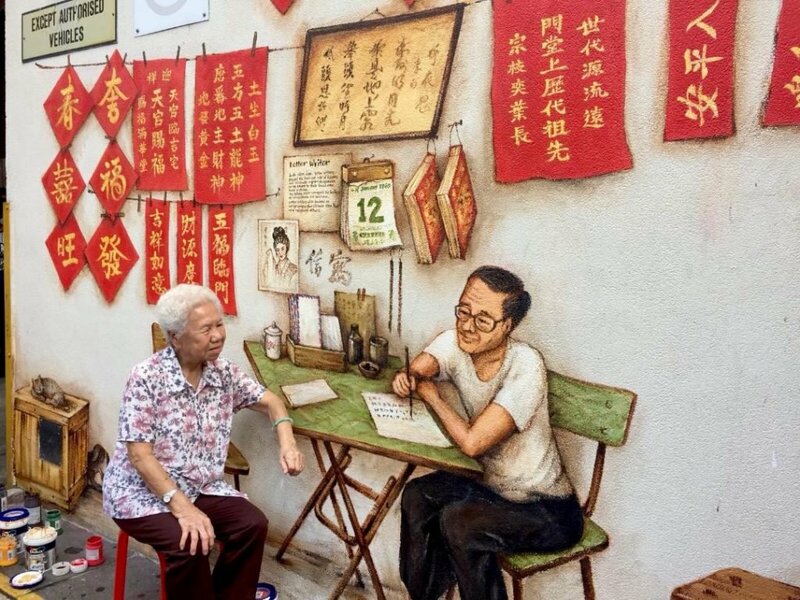 Secondly, for 2 years, I pursued the opportunity to paint murals in Chinatown, experiencing many hurdles, but also learnt many lessons and made many friends along the way. Finally, this is the first mural I painted with my two children! In the olden days, Letter writers played an important role of helping our migrant forefathers write letters to their loved ones back in China. 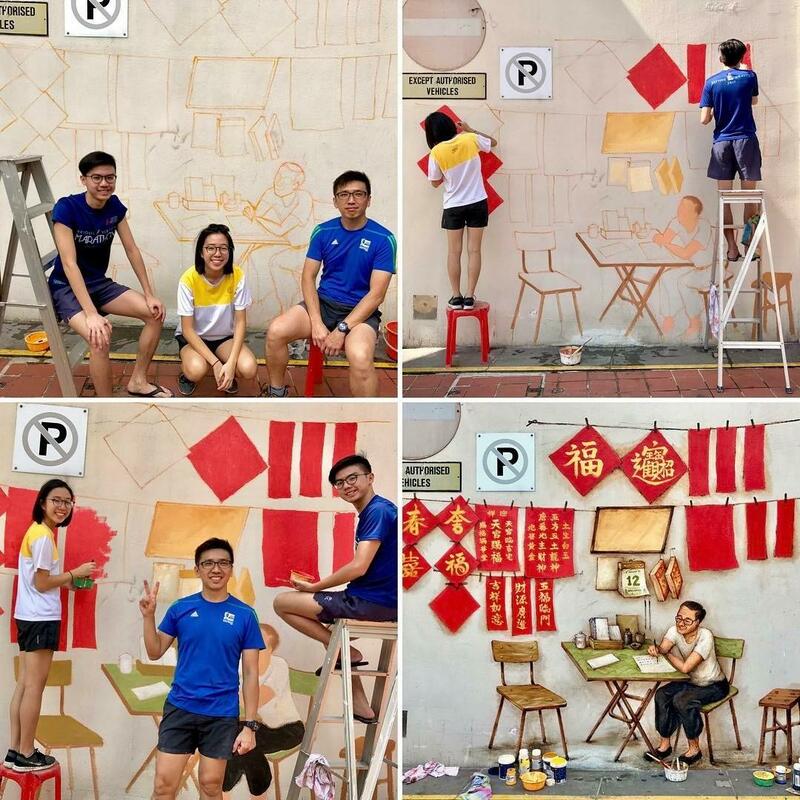 They also doubled as calligraphers for Chinese New Year couplets and ancestral altars. This was a common scene in Chinatown up till the 80s before the big Chinatown cleanup when the street markets, hawkers and traditional traders were resettled inside the mammoth Chinatown Complex (completed in 1983). I missed those scenes! 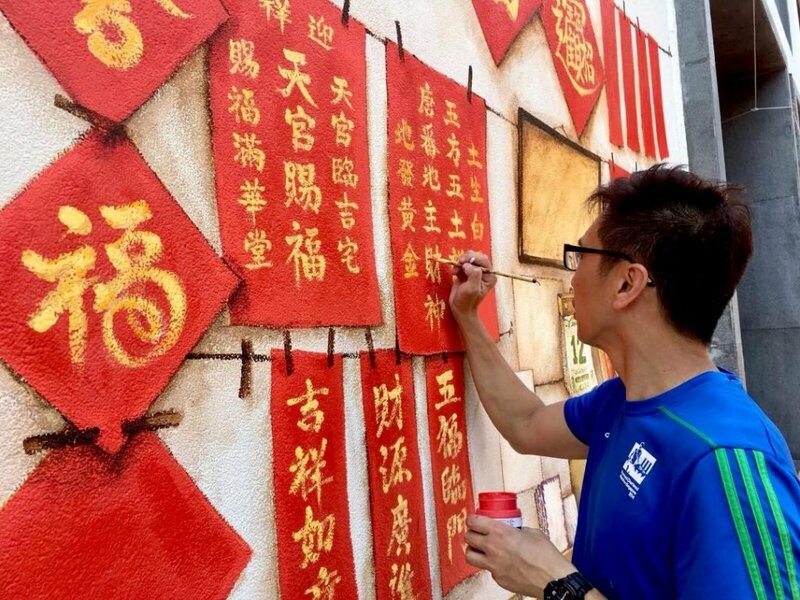 Actually, painting the Letter Writer is part of a bigger dream to paint 6 murals in Chinatown – Letter Writer, Wooden Clog Maker, Cantonese Opera Stage, Chinatown Wet Market, Paper Mask and Puppet Seller, Lantern Festival. I am so happy to have fulfilled part of my dream. Thanks to everyone who helped me get the approval. I hope to fulfil the rest someday! Thank you! 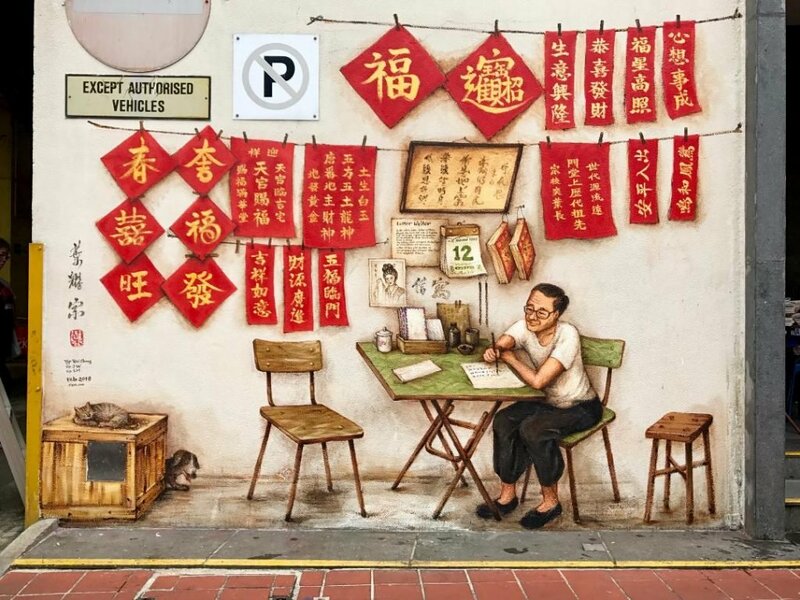 The mural is located at Singapore Chinatown, 336 Smith Street, on the side wall of New Bridge Centre, just outside the CK department store. This was what I late dad did towards every Chinese New Year up to 1983 before we moved to a HDB flat. We had various altars in our old shop house in Chinatown Sago Lane such as 天宮(heavenly god), 土公(earth god), and 灶君(kitchen god). He would write new calligraphies for all the gods to replace the old ones covered in soot after a year of incense. He also wrote a few good words to decorate the house. He wasn’t trained but just did it!